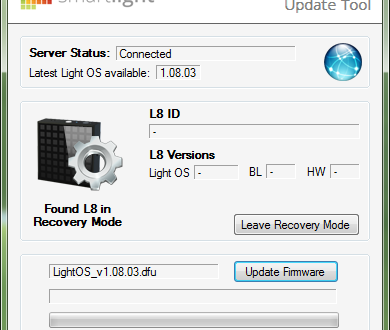 Here is the L8 Firmware update tool! The L8 has two working modes, the User Mode and Recovery Mode. The User Mode will be the default mode that will allow the user to connect the devices via Bluetooth and control all L8’s functionalities. The Recovery Mode, however, will only need to be used for the device software updates or to recover the device software itself in case this one fails. The Firmware tool will detect the L8 working on either Mode, allowing to switch among the two. L8 SmartLight Software is a real time Operating System, that we have baptized as “Light OS”. All current L8 devices will have by default Light OS v1. 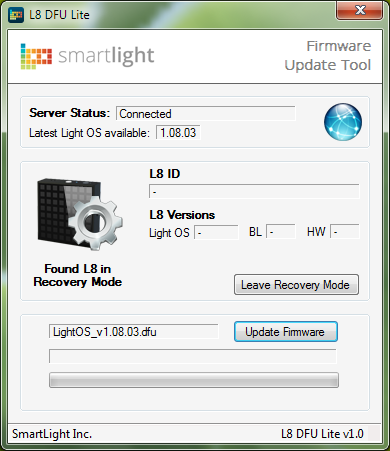 As we will be updating the Light OS version overtime, you will only need to connect your L8 device to your computer via USB and activate the Recovery Mode. By doing this, the tool will automatically connect to our servers to download and install the most recent Light OS version. As you can see, the Firmware Update tool is now available for Windows, but we are working on the development for other platforms and OS.